Heat oil in a wok or large heavy skillet over medium-high heat. Add beef, and cook until evenly brown. Stir in beef stock, soy sauce and butter. Push meat to the side, and toss in onion, celery and mushrooms. Cook, stirring, for about 4 minutes. Add spinach, and cook for 2 more minutes. I was born & raised in Japan, I tried this out of curiosity, compared to the traditional sukiyaki it was quite salty. I think i'll stick to the traditional style. thanks anyway! This was a strange combination of ingredients, I thought. Not something I will cook again. This isn't sukiyaki...! Have you ever even had real sukiyaki before? 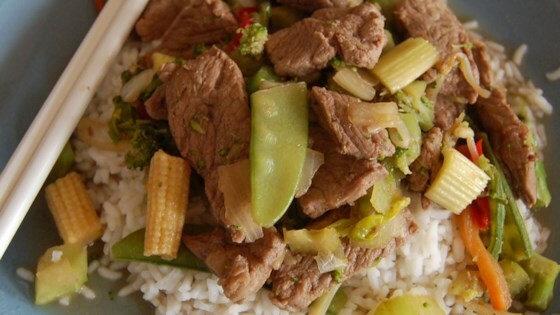 Please change the name of this recipe to something like "Asian Beef" or something. Good recipe. I added garlic to mine . Everything else was the same and it turned out really well. Thanks for posting. We all enjoyed this one, we used a better cut of meat though.